You do not necessarily have to have grass in all your patio, the idea is to prepare this space so that it is not only comfortable but also attractive and functional. You can cover a small space of the floor of your garden with wood, stone, cement and even ceramics; the idea is that there is an elegant, striking and attractive contrast between the greenery of the grass and the new surface you can get. 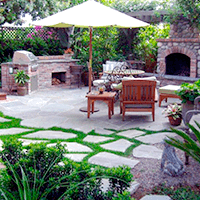 Nothing beats natural stone for a patio. 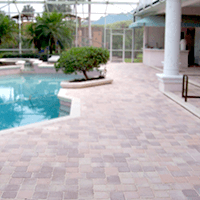 There are many different types of natural stone to choose from including flagstone, slate, bluestone and limestone. 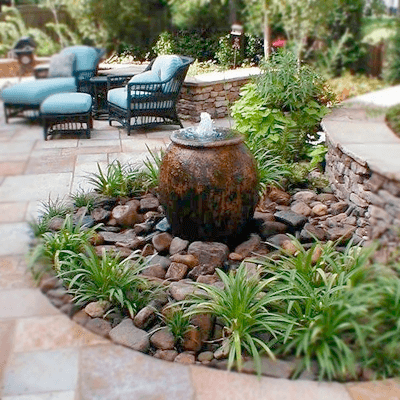 If you have a relatively large patio you can also lean over a fountain. The stone floor will immediately give you old airs, in the same way you can fill the rest of the space with plants or benches sculpted in stone or marble. You can also add some light reflectors that illuminate the splendid fall of water when the sun goes down. A space to enjoy dinners and outdoor meals is ideal for family sharing, however it is not the only alternative. You can choose a corner of your patio to create a family Chill Out area with outdoor furniture , covered with cushions and mattresses, even a Custom Pergola. Think about place this chill out area where the vegetation is thickest. In this manner, surrounded by plants and with the right lights, at dusk and at night, you will have a beautiful place where you can relax enjoying a coffee or a drink. A lot of people tend to design the patio of their house without any grass on it and maybe what you need this spring is to relive the greenery to create a new and fresh look. Whether you chose to plant natural grass or decide to have artificial one, if you feel that your yard needs greenery, just do it. Design and remodeling your patio into a comfortable and functional area so that you and your family can fully enjoy it throughout the year.